If you’ve had to discipline the same behavior several times, it is time to start coaching. Coaching is teaching your child about better behaviors, and it’s focused on what you want them to do. For this to be most effective, coaching should be engaging and fun. There are so many ways to shape behaviors, but the one thing to avoid is lecture. If you find yourself lecturing or giving more than a few sentences to a child about the wanted behaviors, stop and find a better way. At least make it a more open conversation, ask them questions and encourage them to contribute ideas. As part of a conversation you might brainstorm together and list several possible ways to improve a situation. If you are at all creative, you can make up stories related to your child’s behavior. When our girls were little, I told Amy and Catie stories. Amy was remarably like Alicen, and Catie was remarkably like Claire. If the girls had a big upset at the swing set, that night Amy and Catie would have a very similar upset at the sandbox. Your stories should model good problem solving and emotion management. For many common behaviors, there are good children’s story books available. If there is great upset over having a new sibling, you might read Julius baby of the World by Henkes or I’m a Big Brother by Cole. The idea is to use the book as a starting point for talking about emotions and behaviors. Role playing scenarios with your child can be way more engaging than a conversation. Go back through the scenario, act it out together and find better ways to manage. The child can be themselves or the other child as you go back through. This is meant to be flexible so brainstorm and act out lots of possibilities, and continue to guide them towards better choices and behaviors. If your child is hesitant to role play or you’d like to expand from this technique, giving puppet shows is a good alternative. You can use puppets, doll babies or action figures to model better behaviors and work through social situations. If you have an artist, you can coach behaviors by having them draw pictures of it going well. This really focuses them on the behavior and later provides a visual reminder of the discussion. You can also draw them pictures of the wanted behaviors as a gift. For an older child, you might encourage them to draw comic strips rather than single pictures. This adds the layer of being able to work through a situation across frames. For some behaviors, there are games available. There’s The Picnic Basket Manners game by Noodleboro for teaching “may I please,” “thank you,” and, “you’re welcome.” There’s a card game for teaching social skills titled Know the Code, and Feelings in a Jar for teaching about emotions. So many board games are good for teaching about turn taking, and later for teaching about managing competition. You can also make up your own games. To practice listening and following directions, we play Crazy Directions which is giving children a series of two, three or four step directions and seeing how many they can keep in order. On the playground, this might be saying, “stomp to the bridge, jump across the bridge, do two jumping jacks and crawl back.” I tend to repeat this to a child, then say “go!” It’s okay to give prompts if they struggle, and it’s fine to cut back from four to three or two directions the next go around. You can also get creative and plan art projects to coach behaviors. In my preschool social groups, we practice turn taking by sitting four children down to a glue and mosaic art project with only one bottle of glue. We prepare them by explaining they will have to share the glue bottle and talk about how to ask for a turn and what they can do while they wait before we start. We coach them through and add a second glue bottle a few minutes in. 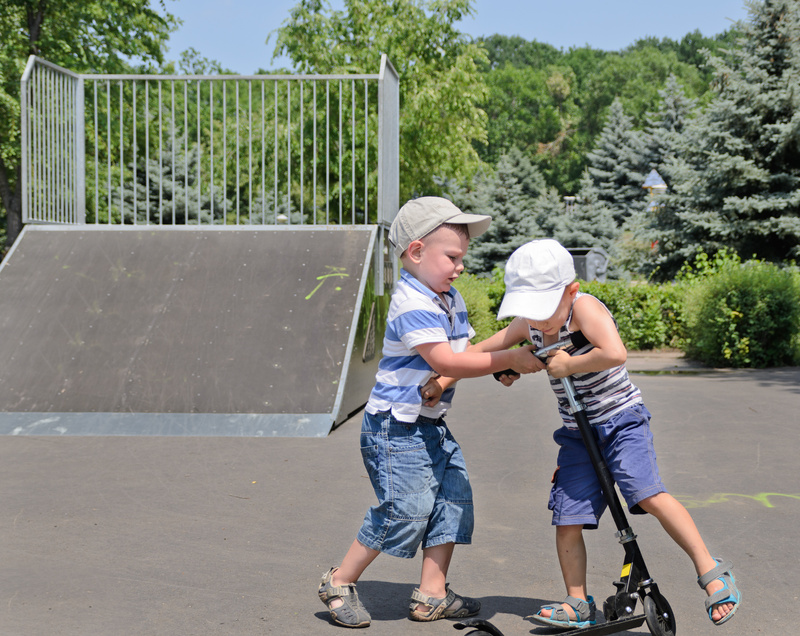 Young children grabbing toys from each other is a common exchange. If your child grabs toys often, it’s good to be prepared. There are ways to best address this behavior before, during and after it happens. While I wouldn’t expect a parent to use all of the ideas below at once, some combination of several should be helpful. Be proactive – Proactive techniques are to encourage wanted behaviors and stay ahead of unwanted behaviors. Catch the Good Behaviors – Once the playdate starts, the idea is to catch and encourage the good behavior as it happens. This is saying, “you asked for a turn, that was nice!” and, “you waited for a turn, you were patient!” Describe the behavior and label. Discipline in the moment – The steps of positive discipline are meant to provide a framework for moving through a discipline exchange. Once the grabbing happens, some combination of the skills below should help you move through in an effective way. I messages – I messages allow you to voice your or the victim child’s emotions and lay blame on the behavior. This might be, “I am frustrated, people are grabbing,” or, “he is upset. He wasn’t finished with that.” I messages are also to avoid you messages which blame the child. A you message, which you want to avoid, are, “I am upset with you, you are always grabbing.” You messages make the listener defensive. Positive intent – Positive intent is recognizing the good intention behind the behavior. It’s shifting how you view the behavior. Positive intent might be, “I know you really want a turn,” rather than, “you are so rude.” In this case, positive intent might be reminding yourself you are talking to a three-year-old. Natural consequences – Natural consequences are what just might happen in life if the child does or continues the behaviors. This would be, “if you are grabbing toys, he might not want to play with you.” These start to be more effective closer to four-years-old. To read more about the steps of positive discipline, read my related blog posts at https://parentingbydrrene.com/?s=steps. Coach out of the moment – If you are repeatedly disciplining a behavior, it is time to start coaching. Coaching is more actively teaching about and encouraging the good behaviors. Avoid lectures – Most children are either too young to listen long, or old enough to tune you out. Be more engaging. Tell stories – If you are at all creative you can make up stories related to turn taking and sharing. When our girls were little, I told Amy and Catie stories. If the girls had a big upset at the swing set, that night Amy and Catie would have a remarkably similar upset at the sandbox. Your stories should model good problem solving and emotion management. Role play – Go back through the scenario to find better ways to manage. The child can be themselves or the other child as you go back through. Puppet shows – This is often an engaging way to teach children about behavior. You can use puppets, doll babies or action figures to model better behaviors. Draw pictures – This is drawing pictures of it going well. You or they can draw pictures of them asking for a turn or finding something to trade. Play games – In this case, you might introduce easy board games and talk a lot about waiting for a turn and taking turns. Art projects – In our preschool, we practice turn taking by sitting six children down to a glue and mosaic art project with only two bottles of glue. We prepare them by explaining they will have to share and talk about how to ask for a turn and what they can do while they wait before we start. We coach them through and add a third glue bottle a few minutes in. Rotation – The plan here is to take about half of your toys to storage, box them up to the attic or the garage. Then, once every month or two, rotate about half of that out of storage with toys that were still in the house. This allows children to focus on the toys that are available and play in deeper ways. It also gives your toys a longer life overall. A toy that has been ignored on the shelf for three months is boring, but a toy that reappears after three months of being gone is like new. Relocation – Just moving toys around the house can be helpful. Once when I was cleaning the house, I moved the dollhouse from the basement to the dining room just to get it out of the way. The girls had not looked at it, let alone played with it, in months. When they noticed it in the dining room, it sparked a new interest. Repurpose – Too many toy cars? Roll some in paint, and then roll them on poster board to make a cool painting. Draw a big map and glue on cars. Donation – Gently used toys are often welcome at donation centers. Friend Swap – Organize a swap with your moms club or neighborhood playgroup. Sell – One of my friends swears by selling big toys on Craig’s List. The much anticipated day at the amusement park was also an unseasonably cold 45 degree day with light rain starting by lunchtime. Early in the morning my girls and I decided to make the best of it, enjoy what we could. The other families bailed by 2:00 p.m. The girls and I stayed, we rode rides in the rain til 7:00 p.m. My 15 year old commented, “Yeah, it’s raining, but we are here, and this is fun.” The dinner show unfolded in a similar fashion. My girls singing and participating with the adults, the other children rolling their eyes. My girls enjoyed the pool, just the two of them. Model it – My husband’s example was about a day we spent with my high school friends at a community garden in Richmond. He says he couldn’t think of a more dull way to spend the day, but decided to make the most of it and went for nature walks and played tag with our girls. Highlight it – When your children keep an upbeat attitude, let them know you noticed. Live in the moment as it is, rather than focusing on what it isn’t – One of the other children commented, “my friend Beth went somewhere good for vacation.” She couldn’t be grateful for where she was when she focused on where she wasn’t. Practice gratitude – The more children practice gratitude, the more they feel it. We were blessed to have time away together as a family, that alone is reason to be grateful. Smile more – It’s easy and can help improve your mood and your outlook. I hope my girls keep this attitude as they grow. I want them to fully enjoy and make the most of wherever they are. For our other family mantras, please visit: https://parentingbydrrene.wordpress.com/2012/07/05/mantras-in-our-family/. Please share your family mantras here! My son, who is almost three and is quite verbal, just told us that his daycare provider hit him. It sounds as though she hit him during nap time when he was “moving around too much.” He said it hurt him, and he didn’t like her. The comment was unprovoked, and came as we were playing at home today (Saturday) – no discussion of daycare, no discussion or recent episodes of him hitting anyone and needing to be disciplined. In other words, I believe him (we have seen him make stories up about what other people have done a couple times, but it’s always been in the moment and for a direct gain, like getting a toy from another kid). He’s been going to the same in-home provider since he was six months old, and he has always seemed very, very happy there. My husband and I think the world of her and are quite pleased with her and with the loving environment she provides the children. That said, we never had a conversation with her about discipline (since he started with her as a baby), and she comes from a fairly traditional background. I suspect that she spanked him to discipline him with no intention of harming him, but we do not want him to be spanked. Do you have any suggestions for how to approach her about this? Or for how to talk about this with our son, or look for signs that things maybe aren’t as great as we thought they were? As further background, my son will be leaving her care soon to go to pre-school, but we now have our seven-month-old with her as well. I am sorry for this. It means the world to trust our children’s caregivers and feel confident as we drop them off. I want to start by saying, I believe him too. Part of the difficulty here is your child is shy of three years old, and children under six years old tend to be poor reporters, so, while I do think he was hit, getting any meaningful details beyond that is difficult at best. It may have been a light tap that startled him, or a real spank out of frustration. Asking more questions also easily leads his answers. I think my best response would be to have a direct conversation with the caregiver. Start by letting her know what was said, ask about her discipline for small and big behaviors and let her know your guidelines. Be clear and firm in your limits of not spanking or otherwise using physical discipline. If you feel comfortable with her response and decide to stay, plan to be a good, open listener moving forward. Honestly, I wouldn’t stay. Whatever her response, my concern is that the spanking seemed to happen over moving too much at naptime which in the big scheme of things is a relatively small behavior. My concern would be for her handling bigger behaviors such as pushing or biting. This is such a personal decision and difficult because you have a long history and otherwise high regards for her level of care. I hope this is helpful. We are going to the beach this Friday with two other families. 11 kids, ranging in age from 14 to two-and-a-half. Megan, my youngest is two-and-a-half years old. The next youngest is six, and all of the older kids can already swim well. The house has a pool, and I’m scared to death about it. Megan is a bit fearless, and my fear is that she will wonder down there, and no one will notice. We obviously plan to watch her closely, but I know that my eyes can’t be on her 24-7. I know of two people that lost kids right around this age to drowning. How do I talk to her and emphasize that she is never to go near the pool without one of the adults without scaring her? I want to scare her a little, but not too much. Part of the difficulty here is at two-and-a-half years old you can teach them about safety, talk, warn them and review, but you can’t rely on them to be good at it at all. I would find a few key phrases, stated in the positive and start saying them now with lots of repetition. My sentence might be along the lines of, “you go to the pool with mommy,” “mommy must go to the pool with you,” and, “you must have mommy at the pool.” When you get to the beach house, go down to the pool together and talk about how she has to have mommy to go to the pool. You might ask, “do you go alone?” “no” (in a light tone). “Do you go to the pool with a friend?” “no.” “Who do you go to the pool with?” “Mommy! You only go to the pool with mommy.” I would review this with her, in a light tone throughout the vacation time. This does put pressure on you to be available for the pool often, but better to narrow it to you rather than say an adult in general which relies more on her for safety. She may think if there are adults or the 14 year old around the pool that’s enough. The next thing I would do is lock the gates and doors in and out to the pool. If a door leads straight from the house into the pool area, I might block it with a dresser. I would also let all the children know, Megan is ONLY allowed to be at or in the pool with you. If any of them see her at or in the pool, they should lead her out and come get you. If you still feel worried, you might ask if they provide or provide your own pool alarm. Gate alarms starts at $30, pool-wave alarms at $70. All that said, watch her like a hawk. Choices work because the child gets to have some power. Choices elicit cooperation; the child willingly does what you want her to do because she gets to make a decision. This is especially true for young children under five years old because they have very little power in their day. They are often told where to go, when to go and to be quiet while they are going there. If you ask a three-year-old who is hemming about having to take medicine, “would you like it with a spoon or a dropper?” and they reply, “dropper,” they are more willing to take the medicine because of their newly found sense of control. The choices don’t have to be important ones. For that child who is hesitant to take medicine, you could offer, “would you like it with juice or water?” The next night ask, “standing or sitting?” The next night ask, “in the kitchen or in the bathroom?” None of these choices are terribly important in the process, but they tend to gain compliance for the parenting goal of downing the medicine. In most discipline, choices come after any needed “I” messages or empathy but before consequences. As you enter into discipline, it is best to address emotions first. Help yourself and your child to calm and manage emotions before you try to discipline or to fix the situation. Once that is done or if that is not needed, think choices before consequences. Choices work because they elicit cooperation. Children are often happy to do the thing you want them to do. Negative logical consequences work because you are putting your foot down. Children are often resentful of the process or angry that you just trumped them. The order of response would be to lead with the choice. And then, if necessary, follow that up with a logical consequence. This puts the happy option first and follows up with the less agreeable way if happiness fails. The other order – consequence first followed by choice – is usually less effective. Children will be less willing to choose if you were just firm with them. An example would look like: “if you do not get dressed right now, we’ll lose our time for the playground. Now which do you want the red or the blue sweatshirt?” You already put your foot down, so it is far less attractive to take you up on a choice. Choices should come first because they are flexible and open. Consequences are closed; there is a built-in outcome. Around six years old, children tend to push for more control over their schedule and routines. It can be helpful if parents offer choices such as, “would you like to read books or color now?” or, “let’s invite a playdate. Would you like to call Lindsey or Emily to play?” Around eight years old, children may push for more physical independence. Choices such as, “would you all like to sit with us or a few aisles away?” can be helpful. In the pre-teen years, children tend to need more privacy. Parents can offer choices such as, “would you all like some time alone in your room or in the basement?” If children feel thwarted in their push for independence, they may become evasive in their efforts. If you feel struggles happening over these pushes for new independence, it is most helpful to examine the amount of control you are exerting over your children. Children benefit from practice at making decisions. 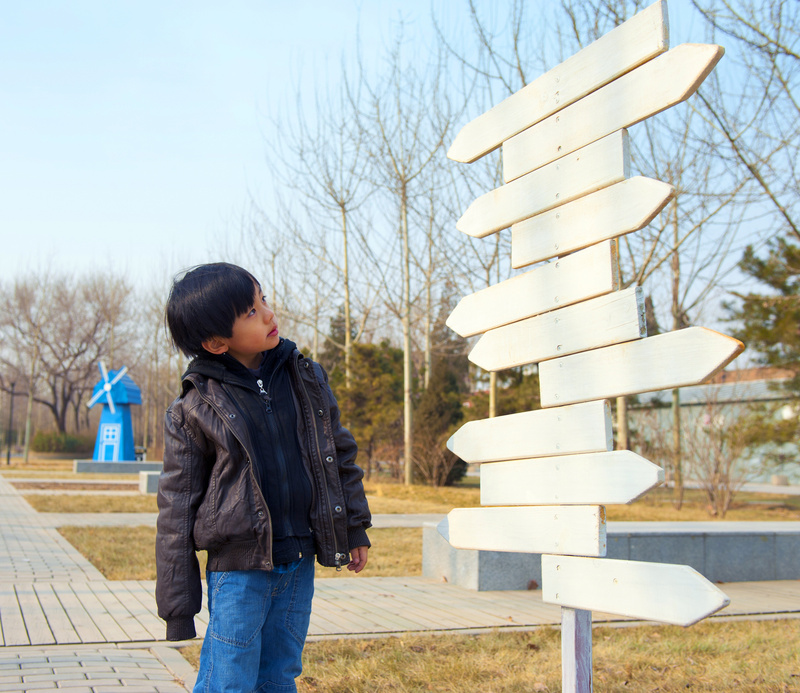 Kohn states that children “learn to make good decisions by making decisions.” Ideally, you are offering these choices throughout the day, not just in discipline. Asking questions like, “would you like peanut butter or ham and cheese?” or, “do you want to play blocks or balls?” provides children with safe opportunities to practice making choices. These opportunities are out of the moment of discipline. There is less hanging in the balance. The better children get at weighing the options and making decisions when the decisions are not weighted with importance, the better they’ll handle choices within discipline. When my children came to me at seven years old and asked, “what should I do about this?” I wanted to be able to give it back to them by asking, “what do you think you should do?” To gain experience problem-solving – to come up with and weigh options – children need practice. As a general guideline, when children are under five years old, provide only two choices. If you open the closet and ask a three-year-old, “what would you like to wear?” the choices can be overwhelming. Children will let you know when they are ready for wider choices. You might ask, “do you want the red or the blue sweatshirt?” If they reply, “how about the green,” they are likely ready for more options. By all means, if green is another sweatshirt which meets your parenting goal, it is fine. If the green is a party dress, and you are headed to the muddy playground, you might say, “I really like the green too, but today it is red or blue.” It is fine to reiterate choices. If this strategy still doesn’t work, you can choose for them, but you have to let them know that is coming. You could say, “this is taking a long time. You can choose, or I will choose for you.” Most kids will choose immediately because they don’t want to lose that power. This shift should not sound like, “okay. This is taking too long; I choose the blue.” If you swoop in and take their power without warning, you will surely be met by upset or tantrums. Another possible challenge with choices, is when a child will choose one, but then push for the other. Let’s say you offer, “would you like cereal or oatmeal?” The child chooses oatmeal, you make it, and as you set it on the table the child says, “no! I want cereal.” At that late point, if you then make the cereal, the child will push for the second option often. There is more power in getting you to make two. If you want that push to end, offer empathy around the first choice, but stick with it through the upset. Say “I know you like cereal. I am sorry, but I’ve already made the oatmeal, and that’s what is for breakfast. You are welcome to cereal tomorrow.” It may take a few times of sticking with the first choice, but if you are consistent, the push for the second thing should lessen. If you have a child who does this often, you can confirm before making the oatmeal. After you have offered and child chooses, you can say, “I heard you, you picked cereal. I am going to make it, and we are going to stick with it. Do you understand?” At least then you’ll feel better about sticking with the first choice. Choices are flexible and work because they share power with the child. They also teach decision-making and often result in a more peaceful exchange than consequences. This guideline is easier to follow with younger children. When a two-year-old says, “I need a ram-baid,” we don’t tend to correct in a heavy way such as, “no, you said that wrong! It is band-aid, not ram-baid.” Rather than feeling like a correction, you might say, “oh, you need a band-aid. let’s go get you a band-aid.” You might very clearly enunciate the correct word, but the words all together didn’t feel like a correction. This guideline is harder to follow as children get older. When your fourth grader has gotten the last two math problems wrong, and is working through a third in the same incorrect way, it is common for parents to say, “no, you’re getting this one wrong too! Why aren’t you thinking?” When corrections feel like corrections, we tend to turn children off to the problem solving process. By all means, you may need to correct the math problems, just use lighter language. This might be something like, “I see your having some trouble working through, how can I help?” or, “hmmm, this seems tough. Why don’t you walk me through the last problem, and we’ll work together?” Yes, you are correcting, but it doesn’t feel like correction. The idea here is to keep them engaged in the problem solving process. Continuing the theme of helping children become independent problem solvers, give hints and suggestions not outright answers. When your first graders asks, “mommy, how do you spell elephant?” Avoid spelling it for them. Give hints and suggestions for how they can spell it. You might offer to help them learn to look it up in the dictionary. If your school encourages inventive spelling (and I hope they do through second grade), you might say, “listen to the word and try to figure out what sounds you hear, those are the letters to write down,” and then slowly, stretch out and clearly enunciate, “el-e-phant.” Here you are teaching them ways, not just to spell elephant, but also how to figure out future words. When your fourth grader asks you for the answer to a long multiplication problem, you might offer to do the first step, or you might offer to work through another similar problem to teach them the steps, and then stay with them while they work through their own. You might offer to read aloud the pages of their textbook that cover how to solve these problems. The idea is to give them enough to get back on track. You are supporting the problem solving process without doing the actual work for them. You are also hoping to provide them strategies for the next go around.